According to web industry report, nearly 81.7% of websites are running on PHP. Hence, it paints the picture of PHP in the programming world and how much crucial it is for websites. To create a working and smoothly running applications, choosing right framework might take your time, but it’s better to wait than sorry. 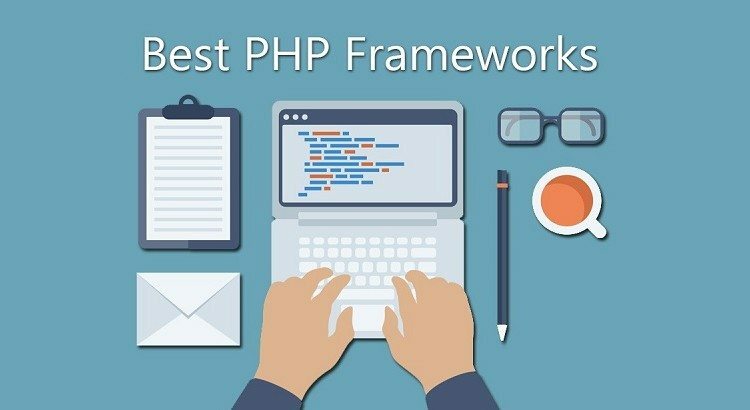 Each PHP framework is unique with its holistic approach. While some save time as well as efforts to create an integrated application than some skyrocket the speed of websites and provide robust solutions to business needs. Undeniably, PHP frameworks are highly useful when it comes to PHP maintenance. There are several types of frameworks and to know about each of them before creating an application is paramount. Let’s talk about them to clarify the confusion that can lead a developer to broom the wrong idea under the carpet. When you are short on time and have to develop an app within a limited amount of it, then choosing right framework can help miles. Toolbox– It’s enabled with integrated components, which allows to write fewer codes and contributes in reducing the risk of errors. Furthermore, it allows the developer to devote his time and skills on other components and gives him the freedom to use skills on coding and managing guidelines, and he can work on necessary tools to carry on operations hassle free. Methodology- Coding is one of most complex tasks in creating an application or constructing a website. It allows efficiency to work on super-complexed tasks and hit the ball out of the park. By following the right methodology, one can guarantee stability, maintainability and upgradeability. 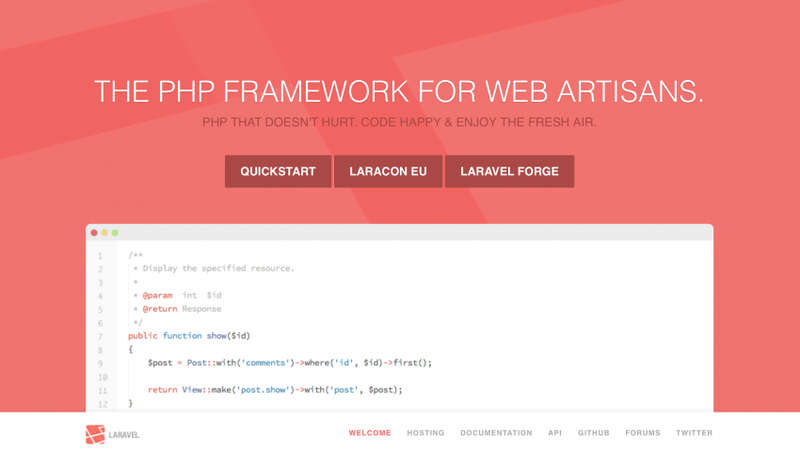 Equipped with tons of exciting feature, ‘Laravel’ is an another brilliant stroke for PHP framework. Written in PHP5, it offers various features like RESTful routing, native PHP or light weight tempting engine etc. Moreover, it offers a solid foundation to well-tested and reliable code due to its various Symfony components. Due to its easily readable and constructed components, it takes less time to perform a function and allows you to speed up the work. Using Laravel means freedom and you can work hassle free on MySQL, Postgres, SQL Server, and SQLite. 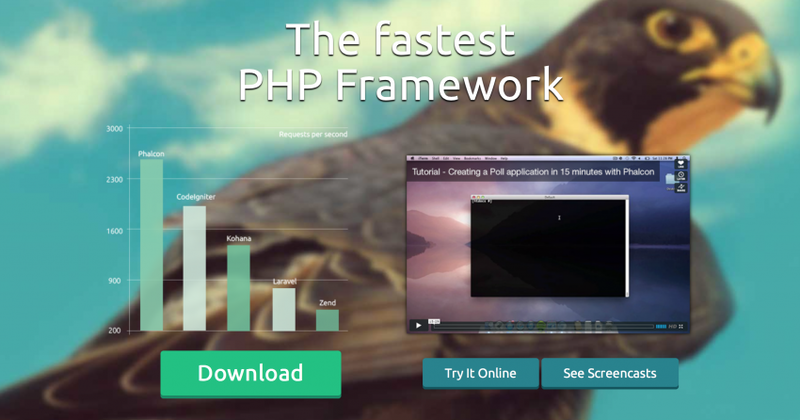 Faster than all other PHP frameworks due to Eloquent ORM. Easily readable and highly impressive syntax. One of the largest community of developers working to maintain the standards and credibility. Completely Flexible in creating small applications to a giant one. Regarded as one of the most faster frameworks, ‘Phalcon’ has emerged as a hot choice for millions of websites due to its lower resource consumption feature. Since its release on 14 Nov 2012, it has gained tremendous popularity in web development world. Programmers don’t need to use or learn C language as it’s entirely built on it. From translations, security, assets management to universal auto-loader, ‘Phalcon’ is a fast performance-based framework and is regarded as a top-most priority by prestigious international companies. Before Phalcon was introduced, speed wasn’t considered as an important factor. As Google updated its guidelines and regarded speed as a crucial part for website’s ranking and success, businesses felt the need to have a reliable and strongly built frame. Hence, Phalcon came as the savior for them. Google loves Phalcon, too. Designed in a way to allow the developer to either use an entire framework or selected objects. The programmer can easily differentiate between controller and modules. Tougher than other frameworks, which makes it the work of a maestro. Built on best Symfony components including Drupal, phpBB, ‘Symfony 2‘ is the perfect answer to create websites and application. Due to its lucrative features, it has witnessed more than a million download till date and counting is still going on. Supported and backed by more than 300,000 developers, it is prophesied that it will likely to create ground-breaking results and methodologies in the coming years. Due to super flexible in nature, it adapts to changes in no time and provides desired results i.e. allowing freedom to customize everything to match the needs and requirements. To some developers, it sounds hard, learning it because of Models, Views, Controllers, Entities, Repositories, Routing, Templating, etc. may sound impossible or time-consuming to learn. But looks could be decisive. Allows fully customization feature to designed and create everything according to the needs. Can work as a standalone micro framework. No need to install entire framework if you want to use it for micro-purpose. Comes with unmatched features like documentations and best practices. Helps in growing ecosystem of experts’ community, IRC’s and mailing lists that sets new milestones during marketing campaigns. Improves productivity during the development process. ‘Bundles’ presentation helps in adding extra functionalities. 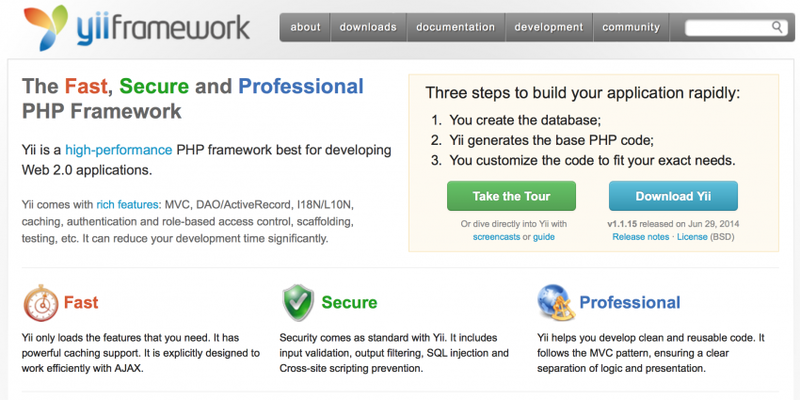 Pronounced as ‘Yee’, ‘Yii’ is coined as a super-fast, secure and completely professional PHP framework. Like all other frameworks, the learning curve gets steeper, but not impossible to learn the beautifulness of codes. The loading time is tremendously fast that opens website within a click. From input validation and output filtering to SQL injection attacks and cross-site scripting (XSS) prevention, it works on certain parameters to ensure the safety and authenticity of the website. If you are looking to develop a website for social media integration and interaction, Yii works best for that. One of the best platforms to write and run both unit and functionality tests. Enables fast loading feature due to its powerful caching system. Works hassle free with 3rd party codes, making it one of the most loved and used frameworks in the world. Detailed documentation to guide if get stuck in the process. 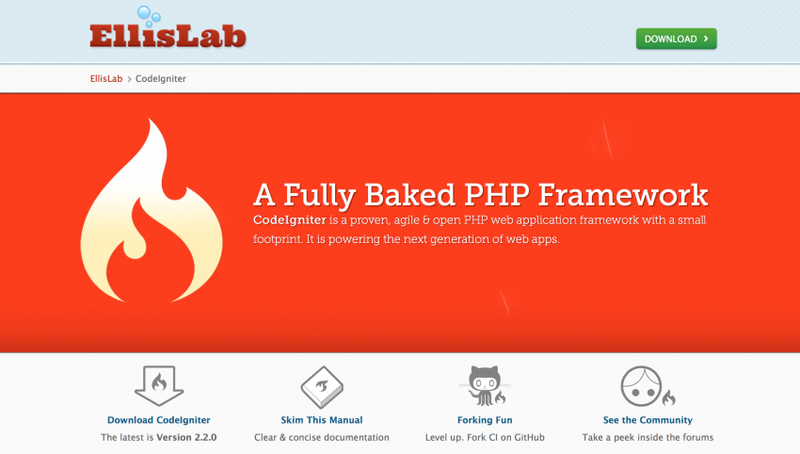 With a small footprint and an open-course framework, ‘CodeIgniter’ is built for developers who look for a simple yet beautiful toolkit for creating full-fledged good applications. In simpler words, if you are looking to bundle the website with seamless features that load website faster and efficiently, CodeIgniter is your perfect answer to cover all the needs. Zero Integration and Configuration needed. Wide compatibility and astonishing speed. 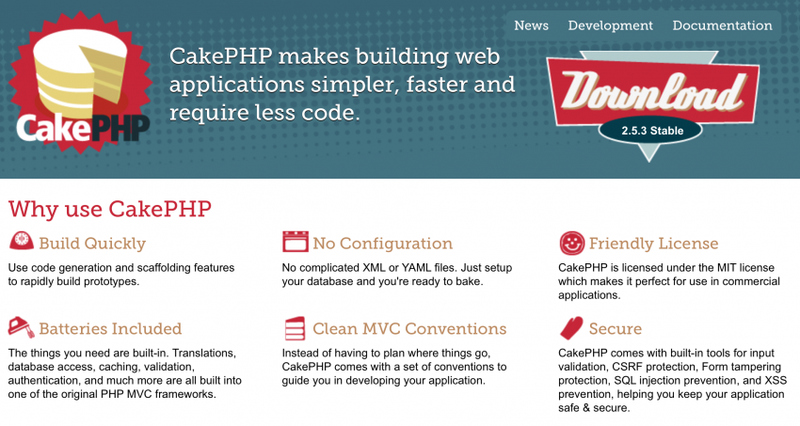 ‘Cake PHP 3.0’ has been used extensively to develop various kinds of websites as it comes loaded with absolute features. Cake PHP is around for a long time now. It requires less code to build an application with higher efficiency and speed. Moreover, it comes with tools like PSR-0, PSR-1, and composer to enable better interoperability that result in less time spent on syncing systems with each other. One of the most prominent features of this framework is; it’s very easy to set up as it doesn’t demand XML or YAML file configuration. Being licensed under MIT, it is completely trustable and reliable. Secure application from various deadly threats. Comes with several built functionalities. Build prototypes at a rapid speed to meet your requirements. Enabled with online testing and PHP testing tools to assist with codes, ‘Zend’ is seen as one of most sort-out and toughest frameworks to build high performing web applications. Basically, Zend needs no introduction as every developer knows the potency of it. As it comes with cryptographic and secure coding tools, it provides enough room for developers to execute and formulate application development in an impeccable manner. Best in Industry Cloud Support on Servers. Programmers who love fully independent packages, ‘Aura’ framework is for them. It enjoys a heavy number of programmers who loving building web application on it, and it is considered on the level of cake PHP. Aura is primarily used to create result-oriented and user-integrated web applications, leaving no room to depend on any other program. 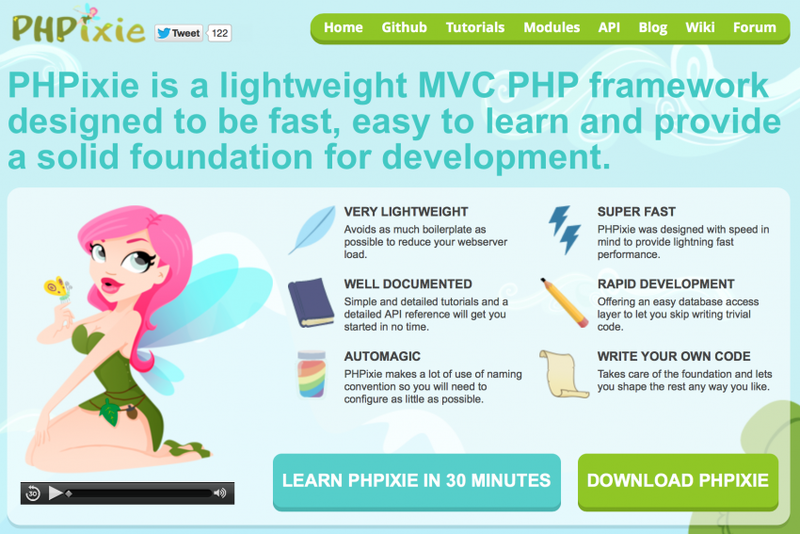 Run on platform PHP 5.3, ‘PHPixie’ is made on ground-breaking coding sequences that are quick to learn and offer various solutions. Basically, it was started to provide a platform for read-only websites, but within few months, the codes were rewritten for web application development platform that resulted in 1.0 release. Unlike all other frameworks, PHPixie works reverse while naming convention. Where other frameworks will name files as /driver/mysql/query.php, PHPixie will name it Driver_Mysql_Query. It brings much better result in readability because of the first name that describes the class in a better and clear way. At first, it may look a tiny thing or a small change, but it can create wonders and make the presentation flawless and steadily faster. Written in PHP 5 and supporting supports AJAX, DRY, KISS, MVC and code reusability, ‘Nette’ is an open-source framework that is regarded as safest and most used around the world. Embedded with unparalleled debugging tools, it takes out all the possible bugs from the application that result in effective and timely working. Moreover, it eliminates any threat to security holes and keep the server completely safe from the phishing spam and hackers. I’m sure that you have acquired much information about different frameworks to choose for your next flawless web application. Each framework for web development has its advantages and its selection often relies on your needs and requirements. So prepare a list about what you want in your application before finalizing any.